Chinook salmon, female spring-run spawner. Location: Butte Creek, California. Date: 9/16/2006. Thanks to Clint Garman, CDFG. Photo by Lisa Thompson, UC Davis. Chinook salmon. Location: Alaska. Photo courtesy of Steve Tjosvold, UC Cooperative Extension. Chinook salmon parr, approximately 10 cm (4”) long. Location: Center for Aquatic Biology and Aquaculture, UC Davis. Date: 5/21/2007. Thanks to Timothy Mussen. Chinook salmon. Spring-run Chinook salmon spawners swimming in Butte Creek, CA on 14 September 2006. Photo by Lisa Thompson, UC Davis. Chinook salmon. Spring-run Chinook salmon spawners swimming in Butte Creek, CA on 12 September 2006. Photo by Lisa Thompson, UC Davis. Chinook salmon. Spring-run Chinook salmon spawners swimming over redds (nests) in Butte Creek, CA on 14 October 2008. The redds are the lighter gray, cleaned gravel. Photo by Lisa Thompson, UC Davis. Coho salmon fry (top) and a Chinook salmon fry (bottom). Location: Shasta River, California. Date: 4/13/2004. Fish were approximately 6.5 cm long (2.5”). Photo by Lisa Thompson, UC Davis. PLEASE NOTE: The photos and information shown here are for the species Chinook Salmon. Central Valley Fall Chinook Salmon are an Evolutionarily Significant Unit (ESU) of Chinook Salmon. 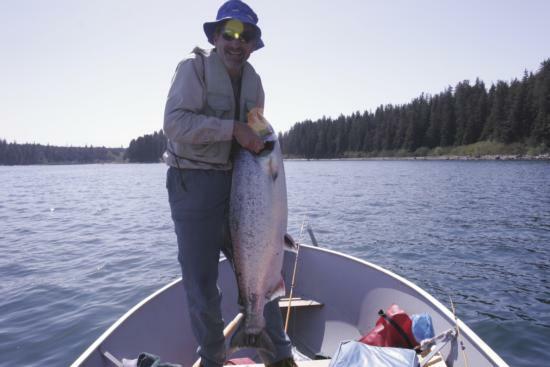 Chinook Salmon are the largest of all the Pacific salmon species and are thus commonly called King Salmon. These fish are anadromous: they are born and rear in freshwater, migrate to the ocean to feed, and return to their natal streams to spawn and die. Two main forms of anadromy exist in the Chinook Salmon, specifically stream-type and ocean-type, although there are many variations on these life history themes. The duration of time spent in freshwater and then in saltwater varies between types of anadromy and between individual populations or runs of fish. 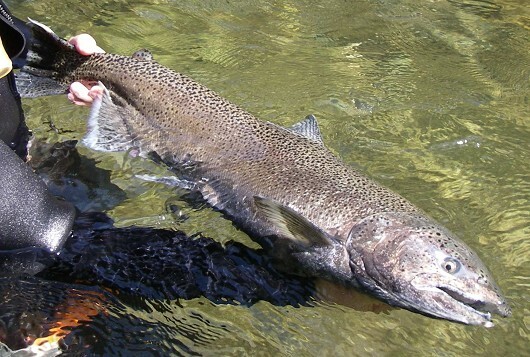 Stream-type Chinook Salmon typically spend more than a year in freshwater before swimming out to sea, where their stay will vary from one to several years. Stream-type Chinook Salmon return to their natal streams in spring or summer before reaching full maturity. The ocean-type Chinook Salmon spend several months to a year in freshwater before smoltification. The ocean phase then varies from one to several years. 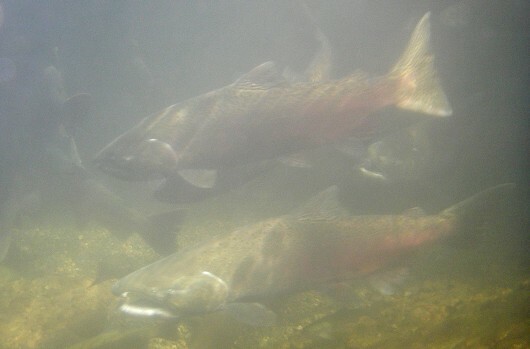 Ocean-type Chinook Salmon return to their natal streams and spawn in August to December. Within the classification as stream or ocean-type Chinook Salmon, fish may be further labeled based upon the time of spawning runs (migration), i.e. fall-run, late fall-run, winter-run, or spring-run. 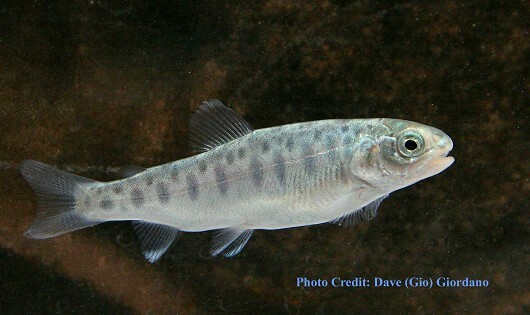 The spawning fish typically choose riffle regions with large gravel substrate that may be near deep pools for cover. The female builds a series of nests or redds in the gravel where she deposits a total of 2,000 to 17,000 eggs depending on body size. The males fertilize the eggs, which will remain in the gravel for 40-60 days. When the alevins hatch they remain in the safety of the substrate for another 4-6 weeks while absorbing the nutrients of a yolk sac. When young Chinook Salmon emerge as fry they are typically swept down to areas of slower water velocities. Young Chinook Salmon tend to occupy a specific pool or area before moving downstream to the ocean. Typically small fry occupy the margins of a stream: back eddies, behind roots and logs, and other areas of bank cover. As the fish grow they begin to move into deeper and faster water. Growth rates are largely influenced by water temperature and the optimal range is 13-18°C. Young Chinook Salmon will survive and grow within the range of 5-19°C, whereas steady temperatures above 24°C are lethal. 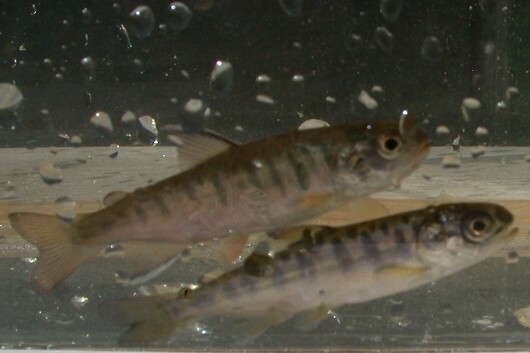 Juveniles feed primarily on drifting insects of different sizes and stages, though the Chinook Salmon may also consume zooplankton or fish larvae. Most feeding occurs at dawn and in the afternoon when favored food sources are present in the water column. Throughout their residence in freshwater, juvenile Chinook Salmon feed opportunistically and the prey size remains fairly constant. When Chinook Salmon reach the ocean, the salmon focus on a diet of crustaceans and other fish, fueling rapid growth rates.